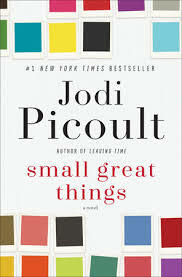 a book chick: "Small Great Things"
my take: Whew. Almost quit on this one. Some of the content was so disturbing I wasn't sure I wanted to read on. Ignorance is bliss. The story is told by three narrators: a Black middle-aged Labor and Delivery nurse, a twenty something White supremacist, and a thirty-something public defender. Their lives come together when the nurse is assigned to care for the supremacist's newborn baby. Great plot, well-developed characters, and an excellent behind the scenes look at the judicial system, the hard realities of racism in America, and the hidden world of hate groups. I was physically ill reading how such groups prey on and recruit people and how they're working to populate their movement. Truly scary stuff. Although I see some of the advantages I have, I have progress to make in ferreting out where White privilege is unseen in my life, and I appreciated this quote/knowledge that my role is to convince other Whites of their privileged position. my source: Son's girlfriend, Hillary, loves all things Jodi Picoult and shared the hardcover copy with me. Uncomfortable but necessary is sometimes a tough sell, but this really does make me appreciate skillful fiction writers so much more - especially since I pretty much refuse to read non-fiction - and how they can open our eyes to where we have been blind or mistaken in our views of the world. Am I next in line for this copy? !